That’s the central question Oakland and Los Angeles-based artist Kenyatta A.C. Hinkle poses in “The Retrieval,” a new solo exhibition at the San Francisco Arts Commission's main gallery, featuring a series of works inspired by young black women who have gone missing due to human trafficking. According to the Black and Missing Foundation, 64,000 black women were missing in the U.S. in 2014. “The Retrieval” marks an attempt to shed light on the issue, and to conjure up the presences of those missing women through ghostly impressions. 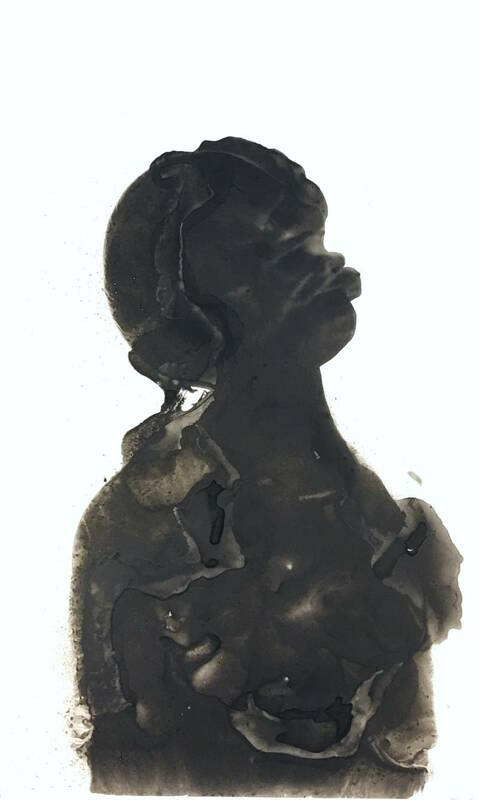 Hinkle calls her paper and ink pieces “unportraits,” meaning they’re not literal depictions of missing or trafficked women; they’re inspired by them. 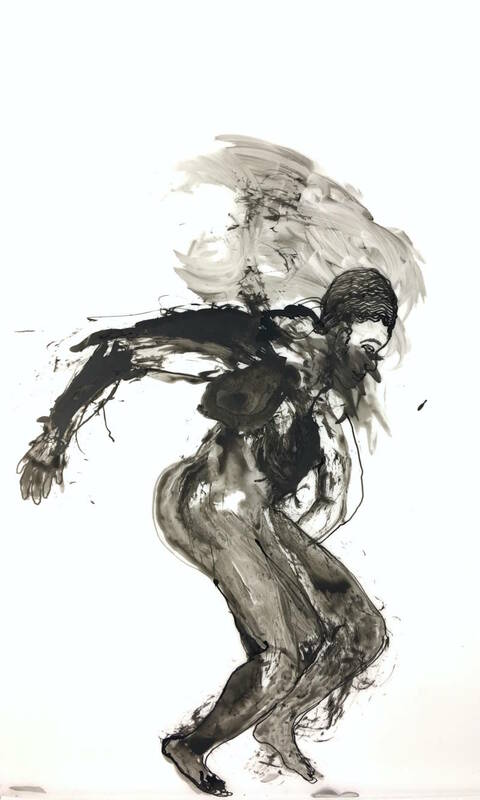 To channel the presences of her subjects, Hinkle says she danced to music from the African diaspora and used handmade brushes -- sometimes “as big as her body” -- built from found materials. 61 unportraits line the walls of the SFAC gallery -- each unique, marked by varied strokes of cloudy ink. And, as Hinkle notes, the ink -- like blood -- extends beyond the confines of each page, breathing a sort of collective life into her body of work. While Hinkle’s unportraits are primarily composed of black, gray and white brushstrokes, the centerpiece of the exhibition is a three-dimensional figure, coated in a vibrant, multi-colored costume. It’s a healer, inspired by Hinkle’s time spent in Nigeria as part of the Fullbright Program. 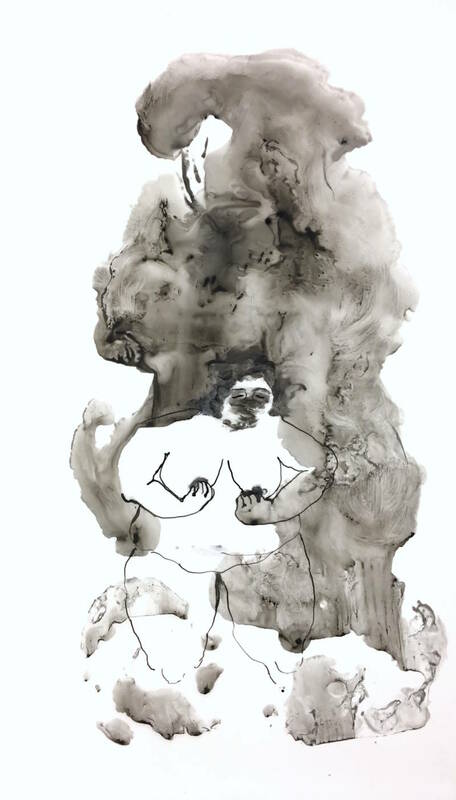 The figure, Hinkle says, is a protector -- a living ghost of an ancestor that comes to impart wisdom and knowledge. It's part of her ongoing "Kentifrica" project, a cultural study of a contested African geography. 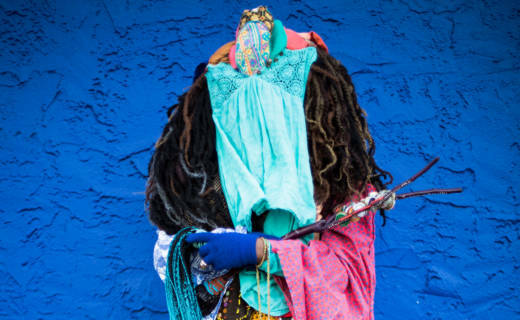 The garment piece is also paired with a video (made in collaboration with Bay Area filmmaker Angelica Ekeke), projected onto a gallery wall, in which Hinkle brings the healer figure to life, wearing the colorful textiles herself. 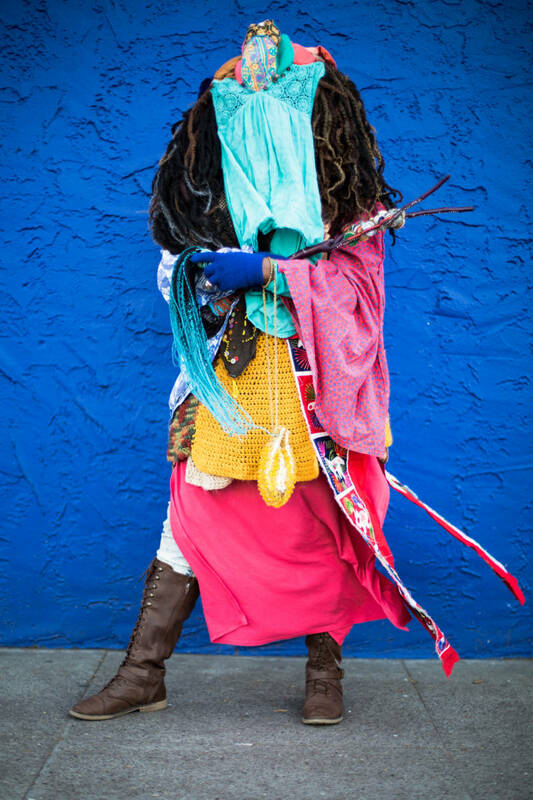 In the film, a costumed Hinkle can be seen moving through some known Bay Area trafficking centers, like Oakland’s International Boulevard, “activating” the spaces through ritual. "The Retrieval" marks the first solo exhibition at the SFAC’s main gallery, which first opened its doors in January 2016. And for Hinkle, that process and the subject matter are inextricably linked. By conjuring the presences of missing women through dance, ink and ritual, she hopes to inspire viewers to become agents of social change. "The Retrieval" is on display at the San Francisco Arts Commission Main Gallery through April 7 and is free to the public.